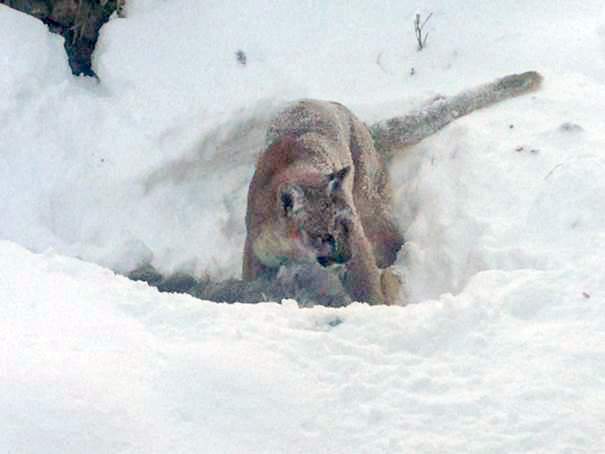 Durangoans living in the Junction Creek area have been abuzz recently with regular sightings of a large mountain lion, but wildlife officials have reminded residents: You live in Colorado. 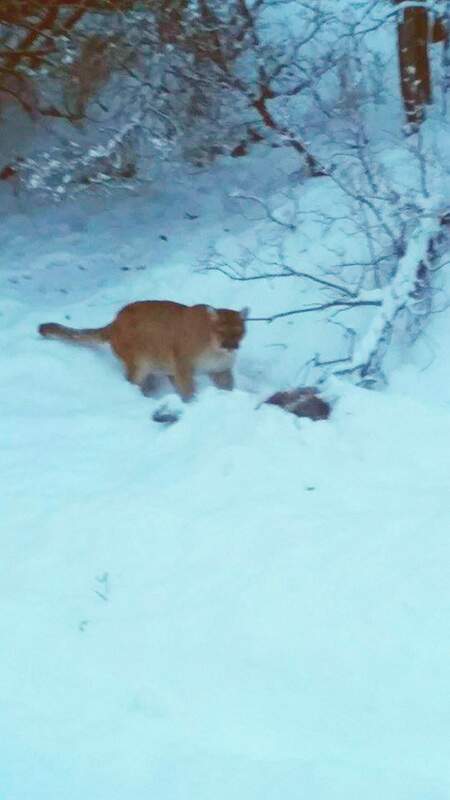 On Jan. 2, Durango resident Nettie Coleman-Loomis posted a picture of the Junction Creek mountain lion skirting the road into the woods on the Facebook page Durango Says What? “It is eating a road kill deer,” she wrote. In the days that followed, social media lit up with similar spottings. On Jan. 5, resident Melissa Dahl said she saw the feline three times, past where County Road 204 splits off from County Road 205, feasting on the same deer carcass on the side of the road, for about a week straight. Durangoan Shannon Friday Gulsby also caught the typically elusive creature peeking out behind brush. Pete Neds, who lives on Junction Creek as well, said he spotted the feline near his garage, and feared it could pose a risk to residents and pets. 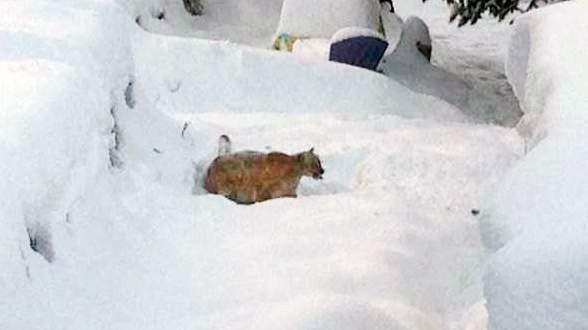 And on Saturday, Robin Wiles said the mountain lion killed a deer 2 feet from her back door. She and the animal were in direct gaze through the window as it began to rip the hair off the deer before consuming it. Wiles said the Colorado Parks and Wildlife moved the carcass to farther behind her house. “However, tracks reveal it returned to the spot of its kill the next day or night,” she said. The mountain lion – also known as a cougar, puma and panther – is Colorado’s largest feline, which averages from 70 to 150 pounds in weight, and can reach up to 8 feet in length (including tail). Its main diet is about one deer a week. The animal remains a solitary creature, mostly active at night and rarely spotted by humans. 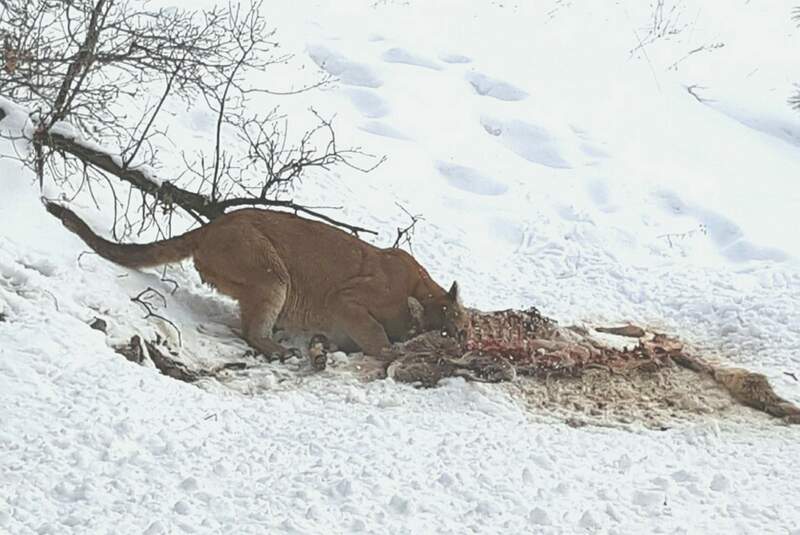 Matt Thorpe, area wildlife manager with Parks and Wildlife, said the department has received a lot of calls about the Junction Creek cougar, but because it hasn’t displayed any dangerous or unusual behavior, wildlife experts don’t plan to relocate it. Mountain lion sightings are rare, and attacks on humans are even more so. The last time someone was killed by a mountain lion in Colorado was in 1997, when a female cougar mauled a Lakewood boy in Rocky Mountain National Park. In La Plata County, the last incident was in 2005, when a woman watching the sunset from the deck of her Florida Mesa home was attacked from behind. The woman survived, and wildlife officials never caught the feline. What’s more common are humans killing mountain lions. Just two weeks ago, wildlife officials in Steamboat Springs killed a lion hours after the animal attacked a family pet. Thorpe said there haven’t been any mountain lion-related incidents this year, and the department hasn’t had to euthanize any troublesome felines. He said three mountain lions were legally killed by hunters in 2015. To avoid any such incidents, Lewandowski said proper precautions should be taken. Spottings of mountain lions in winter are more common, Lewandowski said, because the animal is more readily visible against a white background, exposed by the lack of foliage. In winter, mountain lions also are likely to follow their prey to lower elevations, where there just so happens to be higher concentrations of humans living, he added. For some Durangoans, the novelty of sighting a mountain lion roaming the wildlands of Southwest Colorado has worn off, and become just another pleasure of living in a remote part of the country. At 7:30 a.m. Saturday, a mountain lion killed a deer outside Robin Wiles kitchen window, about 2 feet from the back door. Wildlife officials moved the carcass away from the house, but Wiles saw tracks that indicated the lion returned to the spot of its kill the next day or night. Make noise when outside of your home. Remove vegetation that provides hiding places. Plant shrubs and plants in your yard that deer don’t eat to reduce chance of mountain lions stalking prey. Keep pets in at night. Place livestock in enclosed sheds or barns at night. Encourage neighbors to follow similar precautions. On hikes, walk in groups and make plenty of noise. Keep children close and within sight at all times. Do not approach a lion, and always give the animal a way to escape. Stay calm, talk calmly yet firmly. Move away slowly. Do not run, and instead face the lion and stand upright. Try to appear large: raise your arms, open your jacket, pick children up so they don’t panic and run. If the animal attacks, fight back. Throw whatever you can get your hands on, use your bare hands, and try to remain standing. After a sighting, call Colorado Parks and Wildlife at 247-0855. At 7:30 a.m. Saturday, a mountain lion killed a deer outside Robin Wiles kitchen window, about 2 feet from the back door. Her houseguest witnessed the kill. Wildlife officials moved the carcass away from the house, but Wiles saw tracks that indicated the lion returned to the spot of its kill the next day or night. “At 7:30 Saturday morning a mountain lion killed a deer outside my kitchen window two feet from the back door. My houseguest, Juan de Dios Ishtriahan, a Chilean now living in Paris witnessed the kill. Although of great interest to him as a shamanic student of nature, he thought this event was perhaps ‘normal’ for Colorado, USA. Only because I heard an unfamiliar noise and went downstairs to the check it out did I get to see this myself. I have lived on this property since 1979 and never seen a ‘puma.’ We were in direct gaze with it several times through the window as it first began to pull the hair off the deer before consuming it. 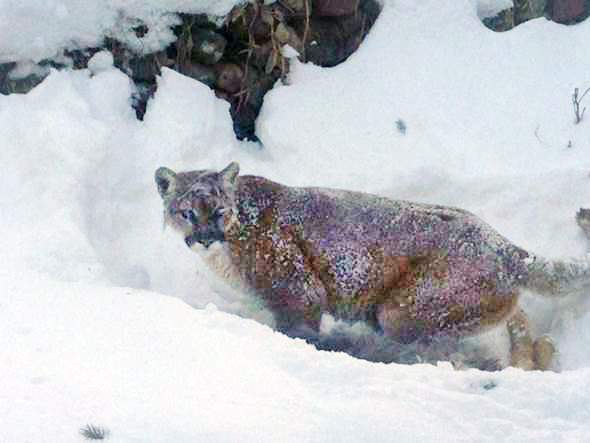 When a third person entered the kitchen the puma fled,” said Junction Creek resident Robin Wiles. 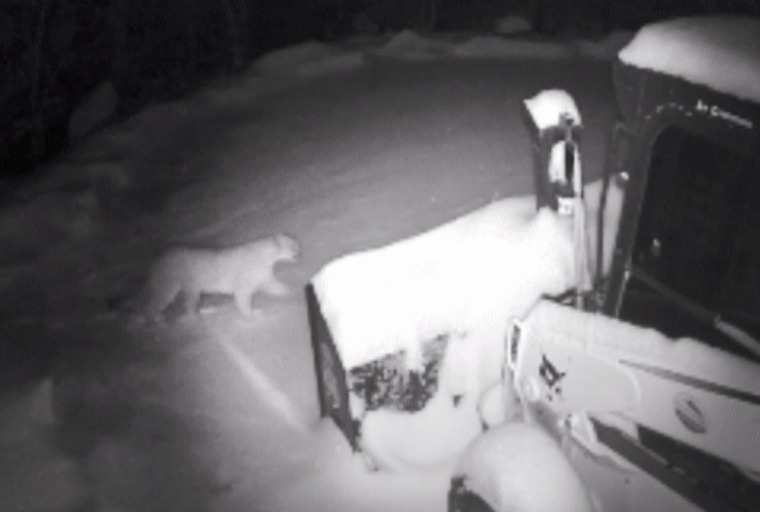 Night cameras near Laura Swan’s house caught a picture of a mountain lion about 9:30 p.m. on Christmas. “The snow plow guy startled him from a nap under our deck the next morning,” Swan said. 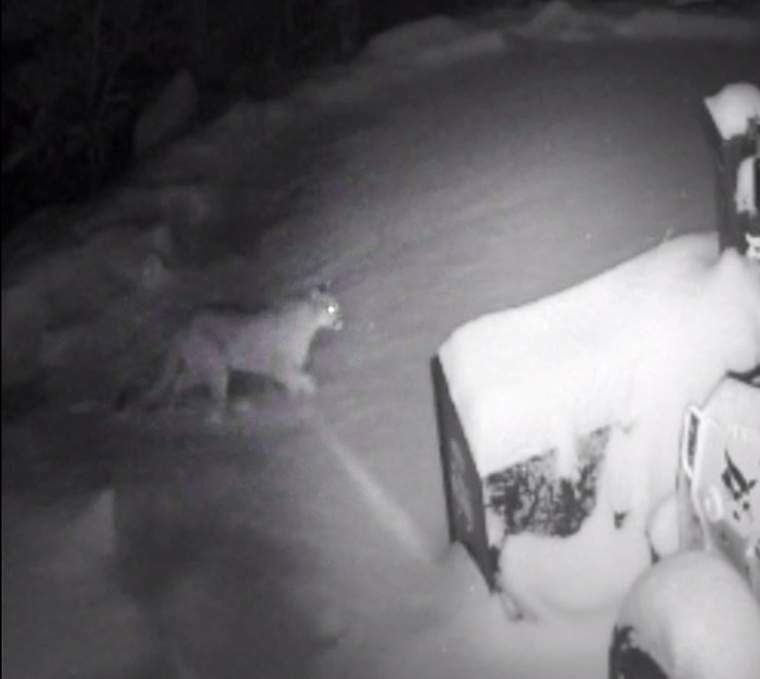 The mountain lion, presumably the same that is seen by many other residents in the Junction Creek area, was caught on camera near County Road 204 a couple of weeks ago. Resident Melissa Dahl said the mountain lion was about 4 feet off the road eating a deer.